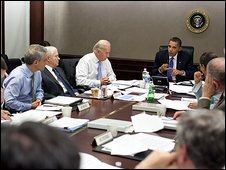 US President Barack Obama has met his national security team to discuss strategy in Afghanistan as speculation mounts over a decision on troop levels. White House officials said Mr Obama discussed timeframes for four options presented at the meeting but took no decisions on them. The president said the US commitment should not be open-ended and governance there must improve, they added. UK PM Gordon Brown told parliament he expected a decision soon. "I have spoken to President Obama and I expect him to announce in a few days what his numbers for Afghanistan will be," Mr Brown told British MPs on Wednesday. Wednesday's closed-door meeting is the eighth in a series aimed at refocusing Afghan policy. Before heading into the meeting, Gen Petraeus told CNN a decision would be made soon on troop levels. "I think we are indeed nearing a decision on this very important topic," he said. President Obama has now had on his desk the report and recommendations from the Isaf commander he appointed in Kabul, Gen Stanley McChrystal, for almost three months. While British, US and other forces on the ground get on with the task of trying to build a reasonable Afghan security force so that Afghans can ultimately ensure their own security and stability, the fear is that the delay at the White House is helping the Taliban, who - with every Isaf soldier's death - are hitting successfully at the international community's will to continue the campaign. Mr Obama headed to the meeting after attending a ceremony honouring war veterans at Arlington National Cemetery. The US has been undertaking an exhaustive review of US strategy in Afghanistan, including troop levels, appears to be drawing to a close. The top US military commander in Afghanistan, Gen Stanley McChrystal, has asked for at least 40,000 more US troops. Reports citing anonymous officials have suggested that a figure somewhat below that mark is likely to be chosen. Speaking on Tuesday, White House spokesman Robert Gibbs said the president was yet to decide. "Anybody who tells you the president has made a decision... doesn't have, in all honesty, the slightest idea what they are talking about," he said. Officials have stressed that the review is not just about numbers, but includes decisions on how troops should be deployed. Among the key outstanding issues is said to be how much the government of Afghan President Hamid Karzai, who was recently declared the winner of a widely criticised election, can be relied upon. One senior source told the BBC that whichever option was chosen, the focus would be on protection and training rather than going out and seeking to kill the Taliban. Critics have said the decision on Afghanistan is taking too long, while Mr Obama has said he does not want to rush a decision that involves putting troops at risk. The BBC's Caroline Wyatt says that there is a growing sense of frustration at the length of time it is taking for the White House to make its decision among military commanders and politicians from other coalition countries. She says that as public support for the campaign wanes in almost every Nato ally, the signal sent out by President Obama's decision will be crucial - and the fear is that the current delay sends out a message to other Nato members, to the Afghan people and to the Taliban and al-Qaeda that America and its partners may be wavering. Any reinforcement of troops is expected to start next spring. The US currently has some 68,000 troops in Afghanistan, contributing to a coalition force of more than 100,000.